When the human beatbox first caught the public eye in the early '80s, it was treated like a fad, ready to disappear with the next strong breeze. However, it survived, and Philly's Scratch has emerged as one of its masters. A no-frills percussion machine born to replicate the backbeat sound, he helped to keep the art form alive into its third decade. Born in Camden, NJ, one of the United States' most violent cities of the late 20th century, Scratch moved to Philadelphia in his youth, both to escape the violence and to make his mark on the city's fertile hip-hop scene. While showing off his skills in the mid-'90s with the local group Schoolz of Thought, Scratch caught the eye of Philly's chieftains and leading international hip-hop innovators, The Roots crew. He earned a showcase track "? Vs. Scratch" on the 1996 smash LP Illadelph Halflife, where he battled the Roots' world-class drummer ?uestlove to a draw, and toured with the group as DJ and as second-chair beatboxer (behind Rahzel). 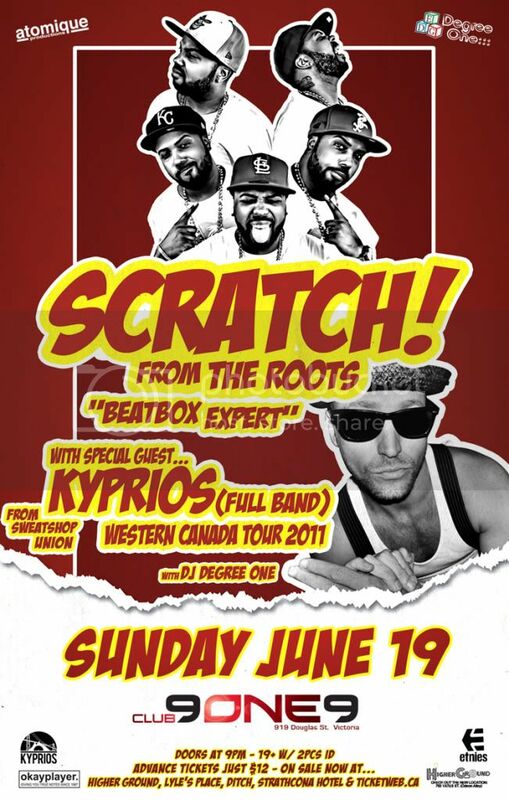 By 1998, Scratch joined The Roots as a full-time member, a position he would hold for two of the group's most acclaimed records, Things Fall Apart and Phrenology. He released the well-received solo album, The Embodiment of Instrumentation in 2002, one of the first all-beatbox records, and the following year left the group to pursue his own sound. While he displayed his talent in fields ranging from pop to jazz over the next six years, he didn't release a sophomore solo effort until 2009's Loss 4 Words. A diverse record aiming for a newer, more universal sound, featuring guest shots ranging from the ubiquitous Kanye West to fellow Philadelphian Musiq Soulchild to alt-rock gadfly Damon Albarn, along side Fabulous, Donyute, Snoop Dogg, Busta Rhymes, Smif ‘n Wesson and many more. This record truly furthered Scratch's rep as a musical explorer. During and after touring with the world famous “Roots”, Scratch has shared stages alongside Ludacris, Jay-Z, Eminem, James Brown, Usher, and Kanye West to name a few. Scratch has also appeared on various mixtapes and has guest appeared on platinum albums along with winning a Grammy Award. On a roadtrip to New York City with Prevail from Swollen Members, the aspiring MC/actor/poet was compelled to lengthen his stay in hip hop’s Mecca. Studying theatre at HB Studios in Greenwich Village, hitting monthly rap battles anywhere in NYC and participating in poetry slams at the Nuyorican Poetry Cafe, the young artist was learning amongst the most reputed craftsman and developing his trade amongst them. Winning a poetry slam with a controversial spoken word piece “Hate,” Kyprios headed back to his hometown of North Vancouver to transfer his education into practice. Kyprios released the independent EP “Mic Tease” that would be the catalyst to get him performing numerous club shows and begin to host a weekly open mic poetry series dubbed “Come With It” in Vancouver. During this period, Kyprios was also a founding member of the two time Juno-nominated Sweatshop Union. While working within the group, Kyp maintained his solo identity and continued to write and record his own material. This output included three tracks featured on the Local 604 album, which was released by BattleAxe Records. BattleAxe also selected Kyp’s song “Master” for inclusion on their Lyrics Of Fury compilation. Kyprios’ solo work caught the attention of Sony Music Canada when he sent the company a package containing some tracks and a video of the slam winning, spoken word piece “Hate.” Kyp signed with the label and began a tumultuous period trying to do the impossible: make commercially viable underground music satisfying a record label and his core fans. He also offered outside help on Sweatshop Union’s juno nominated “Natural Progression” from Toronto at this time. His solo effort resulted in the two time, Juno nominated “Say Something,” featuring production from Saukrates (Kardinal Offishall, Method Man), Billy Mann (Pink, Kelly Rowland), Rob The Viking (Swollen Members) and good friend Tawgs (Lights, K’Naan). With the unfortunate timing of the industry’s changing climate, Sony Canada was merged into BMG and Kyprios’ solo record was shelved but his career was not. Kyprios moved back to Vancouver, re-joined Sweatshop Union to begin a rigorous touring schedule and put out the Juno nominated “United We Fall,” and the critically acclaimed “Water Street” albums. He recently released a new solo offering entitled “12:12″ which propelled him into a radio competition for one hundred thousand dollars in Vancouver, through the Peak radio station called the Peak Performance Project. Kyprios eventually went on to win this prestigious competition and recognizes this experience as the most informative/beneficial of his career.